This week the impossible project just released a batch of their first re-created instant film PX100 for the sx-70 cameras. I snatched a couple packs and 600 film will be following soon. Eek! Instant photography is coming back and in a big way! To celebrate and just cause I like you all so much, I am giving away another polaroid camera! Yup! Yup! A polaroid camera!!! Then, you will be ready for when they release that 600 film to dance your way into the land of instant photography! 1. Leave a comment telling me your favorite item from one of my sponsors... aim's shoppe - downtown girl designs - shey [b] - warm sugar - lisa leonard - misha lulu - hijkids - orangepoppy. 2. Make sure you are a follower or subscriber of my blog and tell me so by leaving another comment. 3. Blog, tweet, or facebook about this giveaway and leave separate comments to the links here. Now, if you do all of the things mentioned above, you might even be able to up your chances by getting your name in 5 times! Fantastic, right? For a polaroid camera, it is definitely worth it! Those overseas are also welcome to join. The giveaway will end at 8am PST on Wednesday, March 31st and don't forget to come back Thursday to this post as this is where the winner will be announced. Good luck! March is coming to an end and if you are interested in becoming a Cakies sponsor starting April send me an email! The lovely random generator chose... Allison! Congratulations Allison! Please email me your address. Thank you to everyone else who entered and I promise to do another one soon. You will have another chance! P.S. My favorite item from one of your sponsors is SheyB's "aqua leaves" strap! hello! i adore the Peach and Yellow Hair flutter from aim's shoppe! Oh how i've wanted an instant camera for so long! and i follow your blog too. love it! I love the Butterscotch Bangle from Orangepoppy...it's beautiful! My favorite thing from one of your sponsors is the sweetheart tree necklace from Lisa Leonard. oh! And my favorite item by warm sugar is "Simone." Love her leg warmers! http://www.etsy.com/view_listing.php?listing_id=39736162. She reminds me of my friend Simone, the most world-traveling chick I know! i would LOVE to win! this is wonderful!! my favorite thing from one of your sponsors (orange poppy) is the pink petal ruffle necklace! i also blogged :) getting my entries in!! I love the Owl pillow from Aim's Shop. So cute. Hello, Rubyellen! My favorite item is the Audrey doll from Warm Sugar! Here is where I bloged about this great giveaway!. Thank you so much for the chance. FUN!!! I love the Bird Pillow from Aim's shop!! Super cute stuff! (#3) just tweeted your giveaway @ssmast!! (#4) Just facebook-linked to your giveaway! What a great giveaway! And your sponsors have so many great things. My favorite right now are the baby spoons from Lisa Leonard. warm sugar's paxton boy dolls are CA-UTE! and i follow this lovely blog of yours. Oh wow, you are so generous. I cannot wait for the 600 film.....sooooo excited. I will be stocking up. Please don't include me in the giveaway I just wanted you to know how sweet you are. who wouldn't want to win a camera? i'm a follower! i love the posy dolls from warm sugar. i LOVE the Georgia Peasant Blouse in Yellow Dots by M.O.M. on the hijikids site! CUTE! I love Shey [B]'s pleated sage camera strap... and I would love to join the world of instant photography! I am thinking the downtown girl design hobo bags will be wonderful since I love the rest of her stuff. i love lita's coin purses and the custom posy dolls from warm sugar. if you get a chance, stop by my blog and join my ruffled inspired giveaway! The leg warmers are too cute and the fabric used for her body is amazing! My favorite item is the Simone doll from Warm Sugar. I am a follower of your blog, you are my favorite of all. And I just broadcasted the giveaway on Facebook. I wish you knew how much I want to win this! Pretty bad! And I most definitely follow your blog! I love this simple yellow flower from aimsshoppe: http://www.etsy.com/view_listing.php?listing_id=43076798 So bright and cheerful! I am in love with the 'Fall Apple Tree' camera strap slipcover, but I adore her entire shop!!! And I am a follower of you sweet blog! I love Audrey doll from Warm Sugar, so cute & sweet, a great Easter gift for my daughter! Thank you for this fab giveaway! Yay! i love, love, love the Sunshine Forest w/ Yellow Minky at shea*[B]! i also subscribe to your lovely, inspiring blog! hello! i really like the polka hair flutter from aim's shoppe. i recently got a bad hair cut and have been wearing head bands like crazy to cover it up! ij actually followed your tutorial on the braided head bands and make three for myself and one for a friend! and i do follow your blog :) it is deffinately on the list of my favorites. i can't get enough of your gorgeous girls! my favorite misha lulu item is a tank in the outlet that says "run to look good." love love love instant photography, and am sooo excited about this giveaway!! My favorite item from Lisa Leonard's "fly free" necklace. ohh and I am a blog follower! Yes! I'm totally interested in winning the camera. I am a follower and have to say that my fav sponsor is lisa leonard. I've been a fan of hers for a long time. My favortie item on the site is the sea star necklace. I was also sooooooo excited to hear the news about the polaroids. There's a one-step on my list on ebay but if I win this one then I'll be one happy girl. oh, and thanks for giving us overseas stalkers a chance to win, too! I'm a follower! Thank you for all your blogging! It's always in inspiration! My favorite item from *Shey* [B]'s shop is The Knot camera strap! my favorite item from one of your sponsors is the peasant dress in sunset birds from hijkids. my little lulu would look so sweet in it! is it odd that just entering this giveaway has made my day... perhaps my week? oh, and i am a follower of your blog. I am following your creative and vibrant blog. What can I say thank you for introducing me to warm sugar I love all of them and will be featuring them on my blog too. Another feature for my blog. Ahhh I am in love again with mishalulu. My favourite hmmmm waht can i say there are so many. Definately another feature on my blog. Adoreable hijkids I love love. What a fabulous site with lots of lovely handmade creations. Another feature on my blog. Wow Orangepoppy is unique fun and fabulous.My favourite would have to be the butterscotch bangle. Have i posted too many times. Well I could not help myself i have found so many new sites I love. Including yours and I will look daily for all your great posts. I am posting about your fab offer on my blog now. A huge thank you for the introduction to so many fantabulous sites and your huge prize giveaway. Thank you Rubyellen for this opportunity. I would love to have a Polaroid camera to take lovely pics this spring and summer! Thanks for doing such and awesome giveaway! Oh my goodness! What a fun giveaway! I absolutely love Lisa's open circle bracelet! I love shey b's ruffle straps. so sassy and cute!! Hello! My favourite item from Downtown Girl Designs is The Folklore Story pouch. It is very pretty! Ah yes, I am also now a follower! I love love love the bees knees camera strap from Shey B! I love the bambi and forest friends coin purse from downtown girl designs! I follow you each and every day!!! I have been a lisa leonard fan for a while, but I am also LOVING the creative genius of Orange Poppy --- STUNNING WORK! So very beautiful. And I subscribe to you on google reader. I have over 1000 unread posts on my google reader, but all of yours are ALWAYS read! I just referred a friend to your blog the other day because she has a daughter that reminds me of your Soul. I should send you a link to a couple pics --- it is uncanny to me how much they look alike and make the same faces! cute. (squeal!) 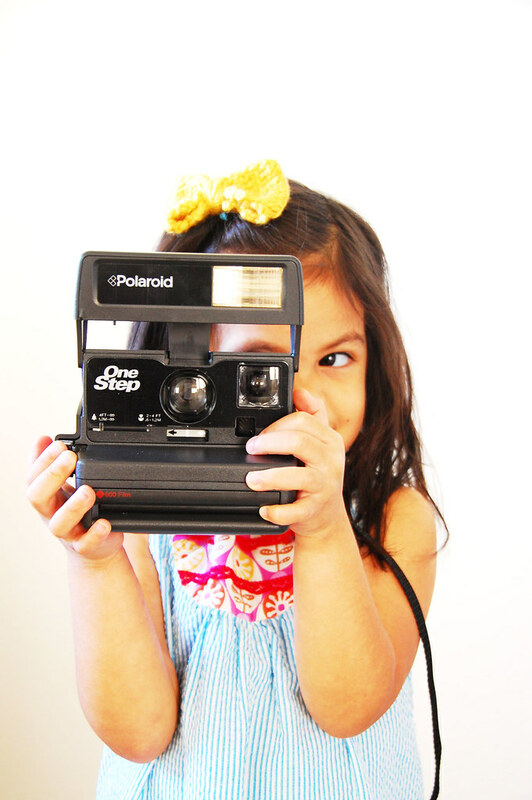 ohmygoodness, i'd love to win a polaroid camera! i love lisa leonard's jewelry, though i always have a tough time picking out just one.. i'd have to go with the 'marked by love' necklace - it's so sweet! and i follow you on bloglovin' - does that count? I am a huge fan of Shey B's camera strap slipcovers. I don't know why I haven't bought one yet! My favorite is a tie between The Lacey Ruffle in Turquoise and Lava Leaves. I follow your blog every day! WOW I'd love to win one polaroid, it reminds me of my childhood. My favourite item from one of your sponsor is the Owl Pillow (http://www.etsy.com/view_listing.php?listing_id=40710624) by Aim's Shop. I have a tumblr, I posted a picture of scraves that my grandmother sent from California (I live in Canada). I asked my followers, aka my friends, on what I should do with them. Mind you, there were almost 30 silk/cotton too-short-to-wear-during-winter scarves. So, one of my friends sends me a link of possible way I could have fun with them. She sent me a link to your blog post on taking old fabrics and making it into a headband. I read it then I started browsing your website to see what else you do. I was amazed how your a mother and an artist. Coincidentally, I admire both professions. Thus, I am a follower! Anyways, from your sponsors, Aim's shoppe (btw, etsy is my fav site) I really like postcards. I collect postcards and I send them spontaneously to my friends. I really like the happy day postcard. I would love to blog this in my blogger...but I dont have many followers. I love the willa dress on hijkids! So cute! I'm a follower too:) I hope I win! I follow! I love reading your blog! Oh sorry--I forgot to write my favorite item. It's the Pink Poppies from downtown girl designs. Loooove that pattern! what an awesome giveaway! i love the simone doll by warm sugar. the rainbow leg warmers are just too adorable! the warm sugar dolls are just devine clearly so much love put into the designs&stitching them together. and wow loved to have come across misha lulu's sweet stuffs they are just beautiful thankyou! i also lovelovelove orangepoppy's grey rose bangle!!! I LOVE Aqua Leaves by *Shey* [B]! Let's see.... I'm still totally in love with SheyB's camera straps, especially with the Chic one. And I'm a follower though google reader. I love Lisa Leonard's "loved" necklace--so pretty! I am loving the stuffed bears Hijkids has right now. Fingers crossed. Would love love love to win this one. You are so good to us. I love almost all of Lisa Leonard's jewelry, but the new mama necklace is just awesome! i just found a polaroid camera at goodwill for a dollar, a precious find! but i just wanted to tell you i love your blog and this is a wonderful gift! My favorite from Warm Sugar is the Miranda OR..... the Pirate Babies, you can't make me pick one. Hi! I LOVE the Grey Rose Bangle by Orangepoppy! Her jewelry is so unique! and I'm a follower! I check your blog daily! OOOH! Always wanted a instant camera! My favorite thing is the "Pleated Ruffle" camera strap by Shey B.
P.S. Your daughters are precious! Hi! I follow you too! I absolutely love HIJkids, especially the Mary Mack dress. I would love one for my little one. I also love polaroids! I hope I win this time! My fav piece is from Lisa Leonard - "From Up Here"! Thanks for the giveaway! Check out the new My Cakies Giveaway!! Polaroid baby!! I put it on my Facebook! Thanks. I blogged! Now I will hope for the best! It's almost my bday - maybe that is a good sign! the paxton doll in warm sugar's shoppe is lustworthy! love! of course i subscribe! i wouldn't want to miss a single word...or cute photo! SheyB is my favorite for sure. Right now I have the hugest crush on a flowery camera strap like the couture. i love the hijkids boy bear in blue. i adore your blog, and would love to be included in the giveaway. I just LOVE Lisa's "Kisses and Hugs Necklace"- it's adorably simple and beautiful! I really really love your blog, so I decided to nominate you to the Beautiful Blogger Awards. I love the owl pillow in aim's shoppe! Thanks for the chance to win. All my cameras are broken at this moment so a polaroid would be a blast! I love Lisa Leonards tiny squares necklace. I would love to get a charm for every member of our family. hi! my favorite item from one of your sponsors is the zanzibar dress from misha lulu! so ethnically sweet! lisa leonard from-up-here-necklace.html - so cute!!! HolyMoly, another Polaroid giveaway! I would love to win -- I don't have one yet! I've been in love with Rebekah from Orangepoppy's designs for forever, but she's got a lot of new things in the shop now, and I'm loving the Petal Pink Ruffle Necklace and the Butterscotch bangle! Hooray for giveaways and polaroids and ruffles! And I'm a follower already! I'm not sure if you'll be able to see it based on my privacy settings, but I wrote about your blog and contest on facebook!